It’s me again, Hank the Cowdog. I just got some terrible news. There’s been a murder on the ranch. I know I shouldn’t blame myself. I mean, a dog is only a dog. He can’t be everywhere at once. When I took this job as Head of Ranch Security, I knew that I was only flesh and blood, four legs, a tail, a couple of ears, a pretty nice kind of nose that the women really go for, two bushels of hair and another half bushel of Mexican sandburs. You add that all up and you don’t get Superman, just me, good old easygoing Hank who works hard, tries to do his job, and gets very little cooperation from anyone else around here. Bloody MurderI’m not complaining. I knew this wouldn’t be an easy job. It took a special kind of dog— strong, fearless, dedicated, and above all, smart. Obviously Drover didn’t fit. The job fell on my shoulders. It was my destiny. I couldn’t escape the broom of history that swept through . . . anyway, I took the job. Head of Ranch Security. Gee, I was proud of that title. Just the sound of it made my tail wag. But now this, a murder, right under my nose. I know I shouldn’t blame myself, but I do. I got the report this morning around dawn. I had been up most of the night patrolling the northern perimeter of ranch headquarters. I had heard some coyotes yapping up there and I went up to check it out. I told Drover where I was going and he came up lame all of a sudden, said he needed to rest his right front leg. I went alone, didn’t find anything. The coyotes stayed out in the pasture. I figured there were two, maybe three of them. They yapped for a couple of hours, making fun of me, calling me ugly names, and daring me to come out and fight. Well, you know me. I’m no dummy. There’s a thin line between heroism and stupidity, and I try to stay on the south side of it. I didn’t go out and fight, but I answered them bark for bark, yap for yap, name for name. 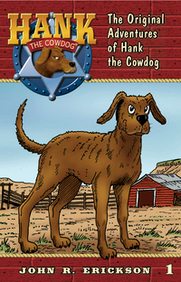 The coyote hasn’t been built who can out-yap Hank the Cowdog. A little before dawn, Loper, one of the cowboys on this outfit, stuck his head out the door and bellered, "Shut up that yapping, you idiot!" I guess he thought there was only one coyote out there. They kept it up and I gave it back to them. Next time Loper came to the door, he was armed. He fired a gun into the air and squalled, something about how a man couldn’t sleep around here with all the dad-danged noise. I agreed. Would you believe it? Them coyotes yipped louder than ever, and I had no choice but to give it back to them. Loper came back out on the porch and fired another shot. This one came so close to me that I heard the hum. Loper must have lost his bearings or something, so I barked louder than ever to give him my position, and, you know, to let him know that I was out there protecting the ranch. The next bullet just derned near got me. I mean, I felt the wind of it as it went past. That was enough for me. I shut her down for the night. If Loper couldn’t aim any better than that, he was liable to hurt somebody. I laid low for a while, hiding in the shelter belt, until I was sure the artillery had gone back to bed. Then I went down for a roll in the sewer, cleaned up, washed myself real good, came out feeling refreshed and ready to catch up on my sleep. Trotted down to the gas tanks and found Drover curled up in my favorite spot. I growled him off my gunnysack. "Beat it, son. Make way for the night patrol." He didn’t want to move so I went to sterner measures, put some fangs on him. That moved him out, and he didn’t show no signs of lameness either. I have an idea that where Drover is lamest is between his ears. I did my usual bedtime ritual of walking in a tight circle around my bed until I found just exactly the spot I wanted, and then I flopped down. Oh, that felt good! I wiggled around and finally came to rest with all four paws sticking up in the air. I closed my eyes and had some wonderful twitching dreams about . . . don’t recall exactly the subject matter, but most likely they were about Beulah, the neighbor’s collie. I dream about her a lot. What a woman! Makes my old heart pound just to think about her. Beautiful brown and white hair, big eyes, nose that tapers down to a point (not quite as good as mine, but so what? ), and nice ears that flap when she runs. Only trouble is that she’s crazy about a spotted bird dog, without a doubt the ugliest, dumbest, worthlessest cur I ever met. What could be uglier than a spotted short-haired dog with a long skinny tail? And what could be dumber or more worthless than a dog that goes around chasing birds? They call him Plato. I don’t know why, except maybe because his eyes look like plates half the time, empty plates. He don’t know a cow from a sow, but do you think that makes him humble? No sir. He thinks that bird-chasing is hot stuff. What really hurts, though, is that Beulah seems to agree. Don’t understand that woman, but I dream about her a lot. Anyway, where was I? Under the gas tanks, catching up on my sleep. All at once Drover was right there beside me, jumping up and down and giving off that high-pitched squeal of his that kind of bores into your eardrums. You can’t ignore him when he does that. Well, I throwed open one eye, kept the other one shut so that I could get some halfway sleep. "Will you please shut up?" "Hank, oh Hankie, it’s just terrible, you wouldn’t believe, hurry and wake up, I seen his tracks down on the creek, get up before he escapes!" I throwed open the other eye, pushed myself up, and went nose-to-nose with the noisemaker. "Quit hopping around. Quit making all that racket. Hold still and state your business." "Okay Hank, all right, I’ll try." He tried and was none too successful, but he did get the message across. "Oh Hank, there’s been a killing, right here on the ranch, and we slept through it!" "Huh?" I was coming awake by then, and the word killing sent a jolt clean out to the end of my tail. "Who’s been killed?" "They hit the chickenhouse, Hank. I don’t know how they got in but they did, busted in there and killed one of those big leghorn hens, killed her dead, Hank, and oh, the blood!" Well, that settled it. I had no choice but to go back on duty. A lot of dogs would have just turned over and gone back to sleep, but I take this stuff pretty serious. We trotted up to the chickenhouse, and Drover kept jumping up and down and talking. "I found some tracks down by the creek. I’m sure they belong to the killer, Hank, I’m just sure they do." "What kind of tracks?" "Coyote." "Hmm." We reached the chickenhouse and, sure enough, there was the hen lying on the ground, and she was still dead. I walked around the body, sniffing it good and checking the signs. I noticed the position of the body and memorized every detail. The hen was lying on her left side, pointing toward the northeast, with one foot out and the other one curled up under her wing. Her mouth was open and it appeared to me that she had lost some tail feathers. "Uh-huh, I’m beginning to see the pattern." "What, tell me, Hank, who done it?" "Not yet. Where’d you see them tracks?" There weren’t any tracks around the corpse, ground was too hard. Drover took off in a run and I followed him down into the brush along the creek. He stopped and pointed to some fresh tracks in the mud. "There they are, Hank, just where I found them. Are you proud of me?" I pushed him aside and studied the sign, looked it over real careful, sniffed it, gave it the full treatment. Then I raised up.